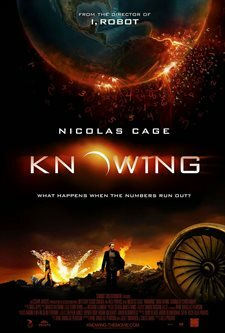 Academy Award Winner Nicolas Cage (National Treasure: Book of Secrets, Leaving Las Vegas) stars in KNOWING, a gripping action-thriller of global proportions about a professor who stumbles on terrifying predictions about the future - and sets out to prevent them from coming true. Download Knowing in Digital HD from the iTunes store. Knowing images are © Summit Entertainment. All Rights Reserved. There are a few common ways to handle prophecy in fiction. The first is the Greek tragedy way: the prophecy comes true, even if your knowledge of it makes it come true. It does not lie, and it is not misinterpreted (this is the Oedipus configuration of prophecy). The second is that the prophecy may come true, but you can stop it or at least alter it if you try (the Terminator view of the future). The final one is where the prophecy comes true, but the meaning of it is changed so that the dire events "happen", but do not actually "happen", e.g. in Lord of the Rings the 'no man can kill me prophecy' works well for the Lich King until he runs into a female warrior. Knowing involves a prophecy, written by a girl in 1950 and placed in a time-capsule. When it is uncovered by the son of Nicholas Cage, Chandler Canterbury (who is serious but not annoying), Cage (an MIT astrophysicist) looks at the page of "random numbers" and picks out the date of 9/11. After that, he goes through it and deciphers it to be a list of all major deaths and their times (including the hotel fire in which his wife recently died); and then the numbers ... run out. There are also creepy, low body-fat, high, cheek-boned, blond-haired 'watchers' who seem to appear at a distance in the back-drops and want to talk to his kid – similar to if a young Sting was a man-in-black agent. Cage, now armed with the knowledge of the future (the numbers run out in a few days), can maybe stop some deaths -- or maybe not. And then, of course, what does it mean when we get to the end of the page? Knowing, as I have heard almost everyone talk about it and note, has an M. Night Shyamalan vibe about it. It has a grainy, washed-out look (once I did wonder what was up with the colors, but I think that may have been more about my film print or the post-production, rather than the technology). It has people doing 'important' and 'meaningful' things; it has an embedded message about faith and portentous events ... and portentous music. A lot of the action would seem utterly mundane without the ominous score thundering over it. On the other hand, the special effects of the disasters are compelling. The subway sequence especially (already shown partially in the trailer) is brutal and horrific to the point of being jaw-dropping. On the other hand, I have read that audiences laughed during some of the more serious scenes, so even with great F/x, it may not be hitting the mark – but was it good? Well, as someone who is a sucker for Shyamalan's work, I am surprised to say that by the end of the movie, I did not like it. In the world of TV (or movie) tropes, there is the concept of "Too Dumb to Live" wherein a character does something idiotic as the plot demands and the audience loses sympathy for them. The problem is not that the character dies (or is saved by the plot -- and lives -- but that loss of sympathy). An example you may have seen is the eating of the grapes in Pan's Labyrinth (something I ascribed to being under a spell, but as it was entirely ambiguous, I think it qualifies). In Knowing the fevered action of the final act is driven by characters not communicating, doing things that seem to make no sense, and failing to make some basic, cohesive choices. It compounds this unfortunate driving force with the idea that a lot of what they do may not matter anyway (if one of the watchers can intervene in events after just watching for the first half of the movie. Have we just been led around by the script for no good reason? Was all the 'drama' pointless? If you see Knowing, you will know, but I guess I can't spell it out here. Knowing papers all of this over with a theme about family, acceptance, and so on, but even that seems to fall flat when we get it shoe-horned into the final minutes; to a degree, even seconds -- without more than a vague feel for the principals involved. Yes, the message is legitimate, but perhaps it could have been delivered in a more fundamentally meaningful way? Finally, some of the science doesn't hold up. This is over-analyzing, but I couldn't help but wonder if the scriptwriters saw the same problems I did and just ignored them. In a "random" string of numbers, there will be roughly as many 1's as 7's, as 8's, and so on. Granted, the sample size might be smallish, but if you look at a bunch of numbers, the first thing these MIT super-brains would do is check the distribution, and when they turned out not to be a random, equal distribution, they would have a good handle on figuring them out. So why (other than the dates, and the kill counts -- the latter of which probably would be random) does it take so long to figure out the other numbers? For that matter, why is one of the characters who winds up being discarded just a back-board to bounce exposition off -- so scared of even investigating the material? He goes from being a sympathetic friend to, well, just scenery. I think the fact that the movie changed hands in terms of the studio (from Columbia to an Australian company; it was shot down-under and made to look like America. They did a good job of it and may have something to do with the way the film feels put together. The love interest isn't entirely out of left-field, but still seems a bit perfunctory. Some elements (such as the hearing-aid the kid has) do not seem to fully come together. Was there no reason for it? None that I could see, but it chews up a modest amount of screen time and gets its own close up's and stuff. The final scene in its way, both utterly predictable (and clichéd), and at the same time begging belief in several key ways does not so much "not fit" the rest of the movie as it sort of assures us that on a grand scale the, script knew where it was going; and yet, despite that, went there anyway. That is disappointing especially with the strong and legitimately creepy first half, some jaw-dropping F/X scenes, and the fact that despite it all, I like Nicholas Cage. I just wish the movie had more up its sleeve than it finally turned out.